You have to sketch every day. What you sketch isn't so important, as long as you sketch. It's like a sport. If you want to play better tennis, you hit the ball every day. You don't wait around for the spirit to move you. You do it. Phones ring. People intrude. You must not be diverted. Time is all that you have. Decide what is truly important and dedicate yourself to it. Eliminate the fluff. 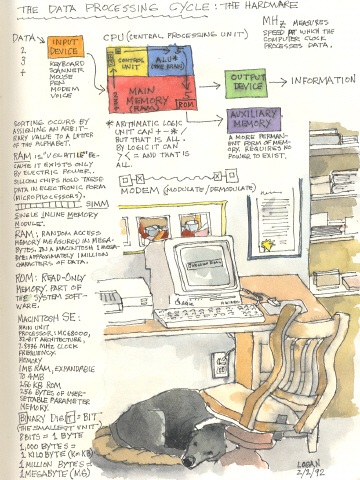 In a computer class (1992), I made my notes and then came home and sketched to illustrate them. It was fun and you don't forget the lessons when you've gone to all that trouble. That's my dog Steve sleeping under the desk.